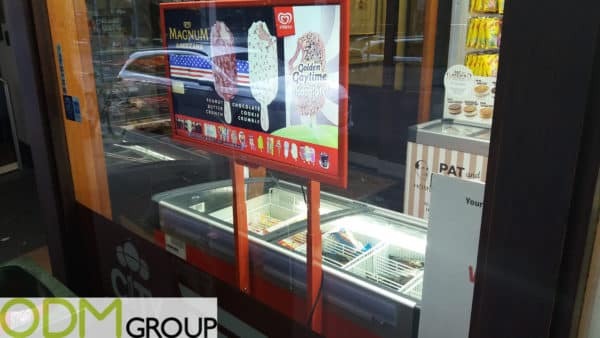 Recently Magnum has had a Custom LED Display campaign to launch two of its latest ice cream flavours. The premium ice cream brand is advertising its Americana range of ice creams and the latest version of the Golden Gaytime. On the left side of the billboard it’s marketed the two USA themed ice creams Peanut butter crunch and Chocolate cookie crumble, while on the right side of it is advertise Golden Gaytime’ s come back in the chocolate version. At the bottom string are instead displayed the other brands and flavours of Wall’s ice creams. What we like the most however, beside the ice cream, is the bright custom LED display. A simple but attention-drawing and clear billboard that is able to monopolize the consumers choices. Why do we like this custom LED display? Advertising: The sections are smartly isolated by using lines and contrasting background colours, this points out the products and give an immediate idea of the information transmitted. Few words, no-frills design and high definition images, this are the features that make it an efficient billboard. What make it extremely visible however is the LED light that magnify its effectiveness. Location: Locations of the billboard above the ice cream refrigerator and at the shop window are just perfect. Visibility at the moment of the purchase, implementing impulsive purchase and from outside the shop, which might lead to purchase as well or to the creation of desire or simply brand awareness. If you look at the photo more carefully you can notice that the LED display is adjustable and avoid other objects to hide it. Raised sales: Combining a good advertisement and the right place should be enough to raise sales. It is pretty implied that such a LED display has a higher level of visibility that results in raised incomes and revenues. If you are interested in this product, please don’t hesitate to contact us. We will provide you with our quality sourcing, designing and manufacturing services necessary to help you in your next promotional campaign.